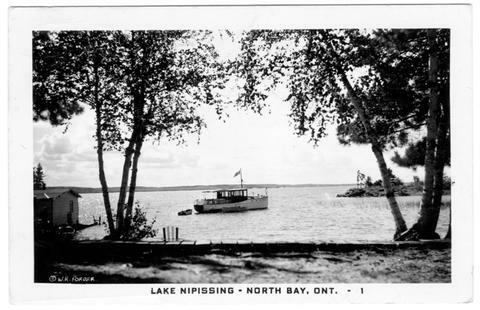 Postcard was cancelled at North Bay, 20 August, 1954. Addressed to: Mrs. Archibald Cullens. Francetown. N H. USA. Message reads: Dear Mother, This is the first letter I have written since arrival. Tonight our house all done but the windows & doors. It is raining but we have a fire in the kitchen stove & we are comfy. Nice to have your letter tonight. We are all well & send love, Paul.